On the Solar Tilting Trike I have done roughly 1700km from the beginning of my tests in March. Therefore I start to have now enough data to understand how it works and whether there is any unexpected behavior. This is quite annoying and unpleasant because at a certain point the motor suddenly kicks in the regenerative braking: in this case the only possibility for me is to stop pedalling, wait for few seconds and then start pedalling again. Additionally I have noticed that sometimes, without no apparent reason, when regenerative braking is selected nothing happens and the wheel spins freely. I have asked the manufacturer what to do in this case: they said to try to deconnect-reconnect the battery….it seems to work but of course it is not very practical and cannot be considered a stable solution. Although I could also use the Torque Sensor, after having tried to change different parameters unfortunately I could not find a way to make it work correctly. Therefore I have the only choice to use the PAS (Pedal Assist System). This way to use the power from the engine is more basic:it is a real shame I cannot take advantage of the full functionality available from Falco. I am very happy about the possibility to use the hub motor without any electric assistance: the so called ‘zero cogging’ seems to work pretty well. A couple of times I had to go back without any assistance and I was able to pedal without (almost) any resistance from the direct drive motor. 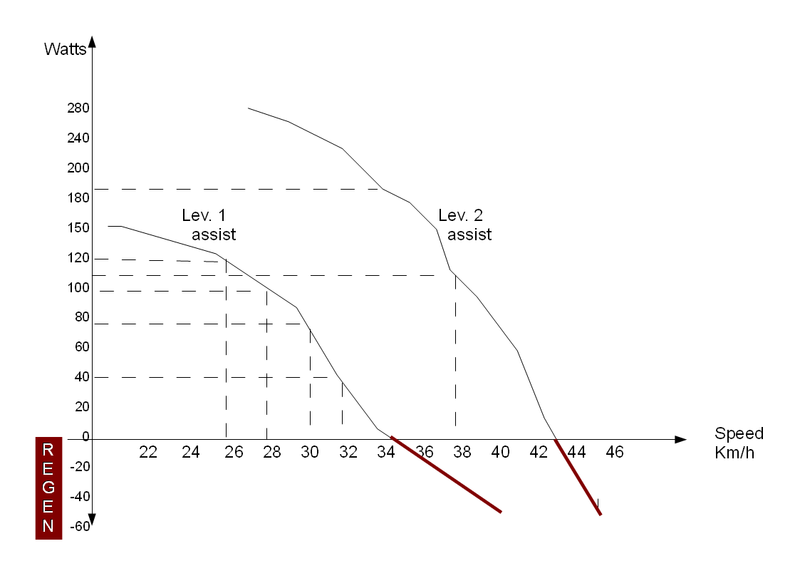 I have done a graph (see below) to explain what happens when using Level 1 and Level 2 of assistance: this is an example but the same behaviour is visible also on the other levels of assistance (3, 4 and 5). We can see that with Lev 1 Assist from 34km/h the engine starts doing regenerative braking (red line), at Lev 2 from 43km/h, etc. 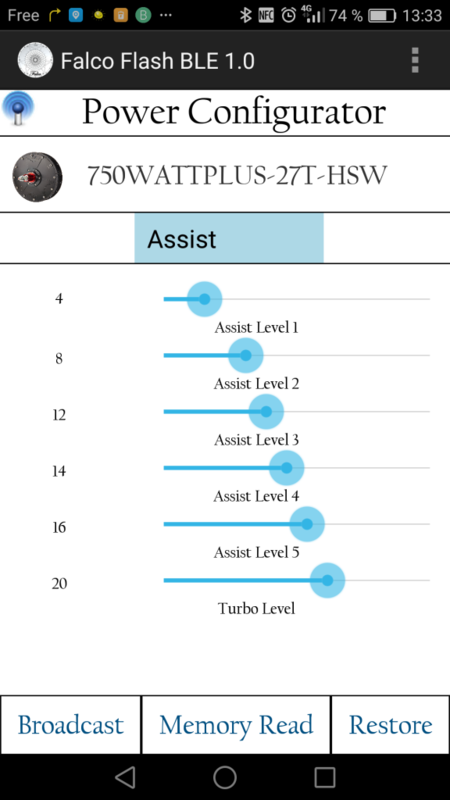 As a quick reference, just to explain how it works, this is the Falco Android interface where in the administration of parameters I can determine the specific value (parametric) of power for each single Assist Level (From Level 1 up to Level 5 ). This is really very handy and practical; after having done this initial setup, the ACTUAL Assistance Level required can be quickly selected ‘on the fly’. And here we can see in the Falco Android interface where I can select on the fly the required Assist Level: in this exemple we can see one green bar which corresponds to Assist Level 1. 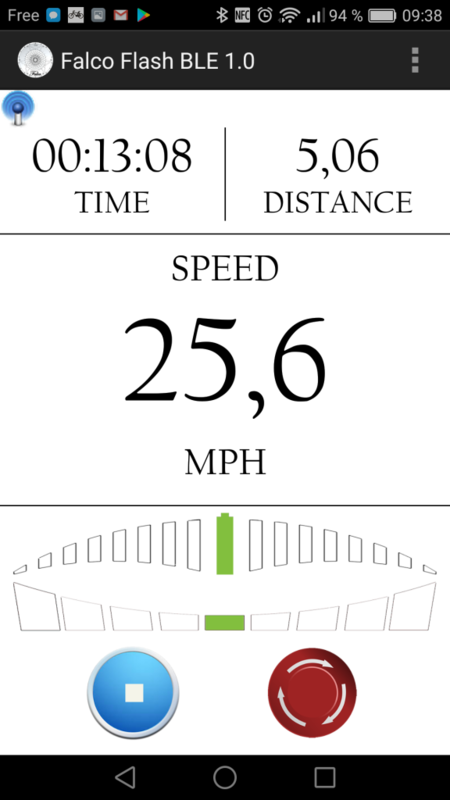 – max speed (unloaded!) for all 5 assistance levels: with level 5 ( at 4′:00″ ) it is just… unbelievable!